The northernmost port city of Germany is idyllically situated between wooded hills at the end of the Flensburg Fjord. Beyond the city begins Denmark. To this day, Flensburg is the center of the Danish minority in South Schleswig. Center of the old town is the Södermarkt with beautiful gabled houses and the town church of St. Nicolai from the 15th century. On the other side, the massive north gate of 1595 is the entrance to the old town. 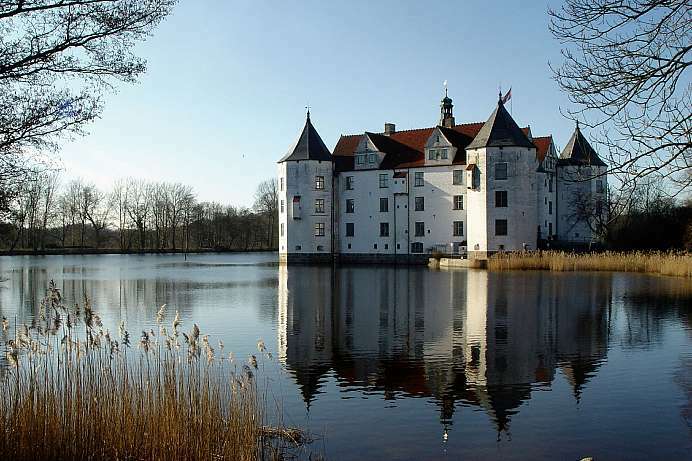 The moated castle on the Flensburg Fjord is one of the most important Renaissance castles in Northern Europe. It served the ducal lines of the house Glücksburg as ancestral seat and was a temporary residence of the Danish kings. The family members of Glücksburg Castle are related to almost all European dynasties. The castle is one of the most famous sights in Schleswig-Holstein. It contains a museum and is accessible to visitors. Right next to the castle garden, the Glücksburger Rosarium was established in 1990/91. The focal point is the former house of the gardeners. In the Rosarium more than 500 roses are cultivated, among historical species, English, climbing and wild roses.